Kia’s mission to be one of the top players on the world’s car markets takes a step further with the arrival of its 4-door Optima saloon, a substantial product that undercuts by a stash of cash the likes of the Ford Mondeo, Volkswagen Passat etc. Pitched in the currently popular up to 2.0-litre turbo diesel market sector, it is a stylish looker created by a European design staff headed up by a former Audi guru and, in the case of the test car, looking resplendent in the £450 cost extra metallic blue paint job. Practicality has not been sacrificed in achieving these good looks, the interior space provides high levels of comfort for five adults and the boot capacity (aided by 60/40% split folding seat backs) is generous though not class leading. Power comes from a willing 1.7-litre/134 bhp turbo-diesel unit that is slightly more busier than some rival units but delivers more than passable performance, Kia quoting a top speed of 125 mph for this manual transmission 6-speed test car (3 mph less for the 6-speed automatic version) and an 0 to 60 mph acceleration time in a creditable 10.2 seconds. Characteristically, the power unit has the usual low down flexibility expected of a diesel engine though the ’window’ of power is not so generous as some contenders in this class which requires the 6-speed gearbox to be worked a lot – perhaps a challenging task at first as the across gate selector action feels a touch heavy until one gets the hang of the action. With the aid of the stop-start system (that can be switched off if required) the fuel economy proved an attractive proposition, the official combined figure being 57.6 mpg. I would suggest around 48 mpg should be achievable which is more than reasonable for a car of this size. The driving qualities border towards the easy rather than exceptional, the steering is precise, the road grip through the fully independent suspension and medium profile tyres feels assured and the ride, though firmish, is generally smooth. Stability is a strong factor, the car sitting well on the road and it takes a very strong cross wind to be even sensed. 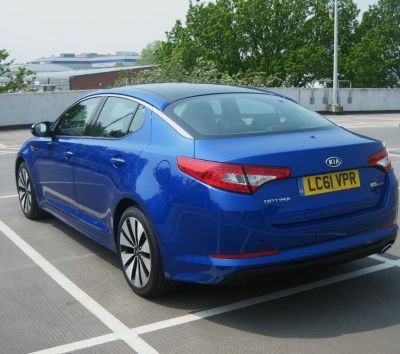 The driver’s life in the Optima is a good one, the generously sized front seats include power adjustment for the driver, heating for both occupants and the driving position adjustment is aided by tilt/reach adjustment of the steering column and excellently positioned pedals. Considering the body style, the overall vision is good and is aided by a rear view camera that appears in part of the rear view mirror when reverse gear is engaged. Though the driver’s seat is provided with height adjustment some shorter drivers may find that the car is a bit high waisted and with a high bonnet line. Fascia appearance is a competent blend of modern carbon fibre/plastic mouldings, a touch of bright metal and clear to read instrumentation, including a distance to empty fuel indicator. For build quality this Kia has closed the gap on the best European products but a critical observer would say there’s a little way to go. Nevertheless, a good overall interior presentation. So far the impression is a great deal of car for an appetising purchase price but the real deal is all the kit that this Luxe version offers – panoramic sun roof, cornering lights, powered windows, dual air conditioning, leather upholstery, tinted and UV reducing glass, rain sensing wipers, welcome and follow me home lighting, ‘round the corner’ rear view camera, cruise control, Blue Tooth with voice recognition, iPod cabling, speed sensing door locking and a lot more but no satellite navigation…an unbelievable package! On road price from £21, 695. As tested £22,170.